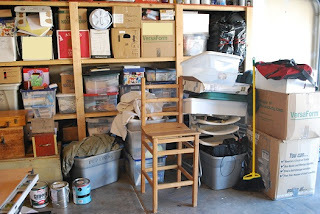 In my first post about the Bagster Bag Bloggers Challenge, I told you all that we had decided to use our Bagstser Bag to help us clean out our garage. When we moved to this house, we downsized a bit from our previous home, and a lot of our stuff ended up in storage in the garage. 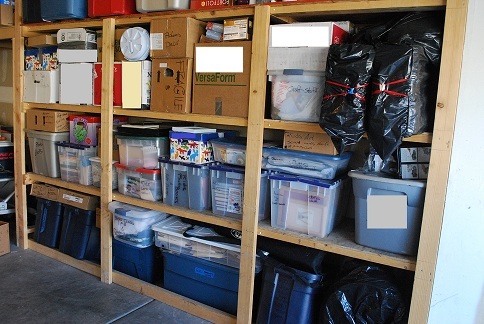 It was about time for us to get rid of some un-needed stuff and to organize the stuff we wanted to keep just a little bit better. This is where the Bagster Bag got put to some good use. And here is the hubby breaking apart some old palettes. (gasp!) Don't worry. They weren't worth salvaging. Here is our loaded-up Bagster Bag. Yep! We really had a lot of stuff to get rid of. And here is the same wall after we were done cleaning. The other side of the garage is a story for another day. But hey, it's a start. Right? Because they are trying to spread the word about this great service, the good folks at Waste Management are offering a $100 gift card to one lucky reader of The Shabby Nest. You can gain additional entries by "liking" Bagster Bag on Facebook or Following them on Twitter. For an entry to be valid, it must have its own comment. This giveaway will be open until Friday, Nov. 5 at 11:59pm MST. Great job on the garage cleanup! My garage could use the same treatment. Thanks for hosting this terrific giveaway! Your garage looks great ! We could so use that bag to clean out our garage ! Thanks for the chance to win ! why haven't I heard of this bag before?!? As soon as I saw your post I said "I need that"! I was looking at our garage the other day and knew it needed to be cleaned soon so we could park our cars in there during the winter. Well this bag would certainly help! gguurrllll... I need to tackle my mess of a garage too so this would be great! Thanks! You are brave to put your garage out there for the world to see. Very nice transformation. Mine is really bad...filled with old furniture and paint cans. I love that Bagster will come and pick up your junk. Thanks for the great review and giveaway! I liked Bagster Bags on Facebook. Thanks! We need to demo our basement in order to finish it correctly and this might be perfect for that. Super practical giveaway! I could totally use this to clean out my garage. Looks great...we just downsized and moved also. We seem to have stuff everywhere, closets, drawers and the storage unit. This would help. Thank you for sharing. Di@http://cottage-wishes.blogspot.com, come by and visit when you have a break! Uggh, we're still at the before stage until the builder LEAVE THE HOUSE, soon, hopefully soon. This is awesome, I've never heard of these bags. My garage is a disaster - I sure could put this item to good use - thanks for the giveaway. So cool! I have never heard of this service before. Maybe this will get my garage in order so we can get our truck inside! Where have you been all my life Bagster Bags?!?!? What a great idea for those of us who love to organize our garages or break our backs getting rid of yard work debris...I hope I win so I can start this fabulous trend with my family and friends!!! I could use a couple of these. I'm determined to declutter and minimalize by the next time we move. Hopefully that's not for a couple more years, but I want to make myself think it could happen any day. I Liked Bagster Bags on facbeook. My husband would LOVE to clean my stuff up out of the garage! Thanks for the giveaway! This is a great way to get rid of junk! Cool product. And sweet giveaway! Great Giveaway! Bagster Bags, sounds like something we could use! Thanks for showing your mess--argh--I appreciate you "keeping it real!" I always feel great after a big cleaning effort! Hopefully, you do too! You did great with your garage!! Id love to win this giveaway...thanks for the opportunity!! That would be great for a bathroom remodel. Which is not on the "soon" list, but maybe I could just hold on to it! Nice job on the garage! Why do garages get so messy? Mine needs an overhaul with a bagster bag! Thanks for the chance to win one! We all have stuff to get rid of! Thanks for the opportunity! We are in the middle of some upgrading on our old house and live in a very rural area. The Bagster would be great! Love your blog too! I could very much use this to clean out our garage. It flooded and got some things very, very nasty. This gives me hope that there is something out there that will help us to clean out my father-in-laws garage as planned this fall (I know, we are running out of time). I "like" bagster on fb. I follow bagster on twitter too! I get crazily excited when I see organizational projects! I like Bagster Bag on Facebook (Wendy T). Follow Bagster on twitter (@won2x). I need a bagster (or 10)! Just found your site. A Bagster would be great! Thanks for offering! Count me in! I would love for my garage to look like yours!! Boy, I really need to clan out my basement. Your garage looks like a good start. I would love to have one of these for my basement storage...it is one big mess! Looks great! We could totally use this! I really need the bagster bag. Thanks for hosting this giveaway. Great job on your garage cleanup. I hope I am not to late...it is definitely too late to figure the time difference..ughhh....I soo need to clean my attic and this bag is awesome!!! !